The continuing purpose of the LGBTQIA+ Scholars Academic Residential Community (ARC) colloquium is to provide a year-long opportunity for you to engage and mentor one another, to meet and interact with visiting scholars, activists, and groups, and most importantly, to examine and discuss gender, sexuality, race, and other identities as they intersect with your academic and university life. You will explore what it means to be a student at the university through discussion, films, speakers, and reading, thinking, and writing about your personal and academic experiences. In other words, this colloquium engages and explores what it means to be an active participant in the classroom, on campus, and in the communities at the university and beyond. Eve Kosofsky Sedgwick, queer theorist and scholar, defines queer as “the open mesh of possibilities, gaps, overlaps, dissonances and resonances, lapses and excesses of meaning when the constituent elements of anyone’s gender, of anyone’s sexuality aren’t made (or can’t be made) to signify monolithically.” Queer is the “experimental linguistic, epistemological, representational, political adventures” that generate opportunities for change, creation, questions, and collaboration. It this spirit of possibility that the colloquium hopes to explore and encourage in the form of an ambitious and generous year-long project. The final project asks you to imagine and put into action the intersection of academics, community, and activism. Over the course of the quarter and the year, the class will collaborate on exploring, researching, developing, creating, and presenting a colloquium project. The goal of the project integrates and draws on specific terms, concepts, or ideas from the colloquium and your other classes, as well as addresses an issue important to the ARC, the university, and beyond. Ideally, in the autumn quarter, you will brainstorm, research, and generate the overall project idea, a timeline, and assign individual and group roles and responsibilities. In winter quarter, you will prototype and implement the project, producing all written, working, and promotional materials. In spring, you will present and promote the project, particularly as part of the UO Undergraduate Symposium. First deadline: As a group, collect, organize, and collaboratively generate a research summary and presentation that articulates the what you discovered about your sample, what its strengths and weaknesses and costs are, what is useful to your project, what is needed to complete the project, what the next steps might be, and any other salient information. You will present this material to the class at the first colloquium project check-in. Second deadline: As a group, brainstorm, prototype, experiment, and create a possible “solution” to the above project brief. You will develop a working pronoun wearable, information explaining the product, and an overview of the prototype’s strengths and weaknesses and costs. You will present this material to the class at the second or third colloquium project check-in. Overall, based on previous quarters’ research and prototype development, develop the final pronoun wearable(s). Research production venues and costs and oversee production (1-2 people). Develop marketing, training, and promotional material appropriate to the determined audience (1-2 people). As a group, prepare presentation for the UO Undergraduate symposium. 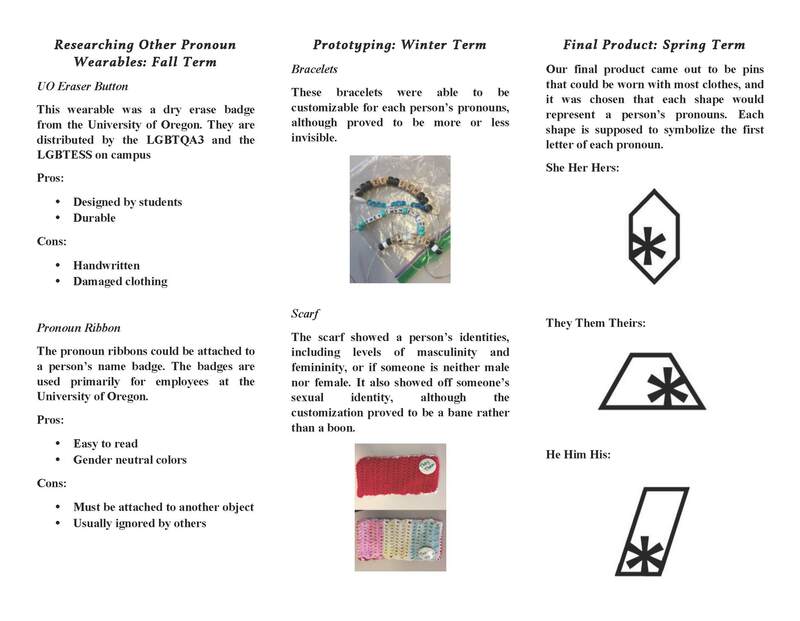 First deadline: As a group, select, revise, and finalize the pronoun wearable(s) for production. 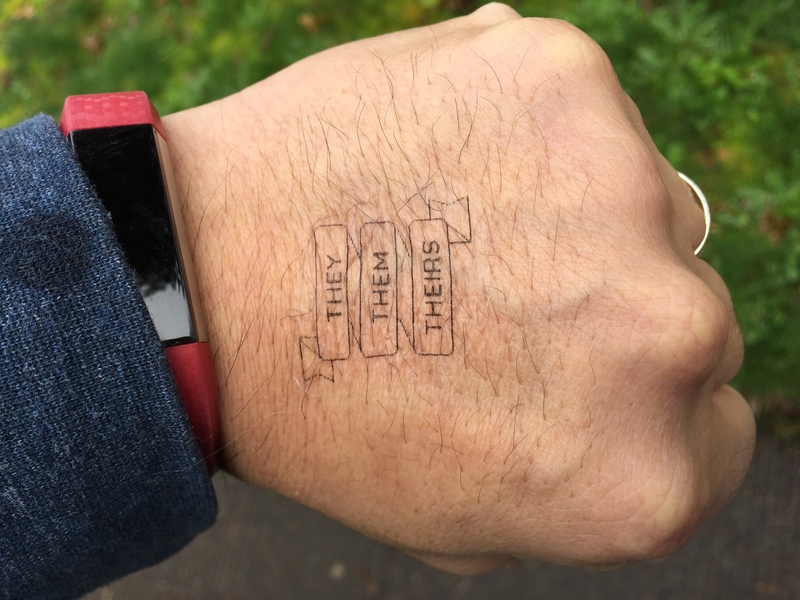 Second deadline: Develop training and promotional materials for the pronoun wearable(s). Third deadline: Develop research poster(s) and presentation materials for the UO Undergraduate Symposium. The most successful projects will have a clear goal, will use different kinds of support and evidence, and will satisfy the project brief and the needs of the targeted communities. Successful projects will engage academic, artistic, entrepreneurial, and activist thinking. Overall, be creative, take intellectual risks, and have fun. 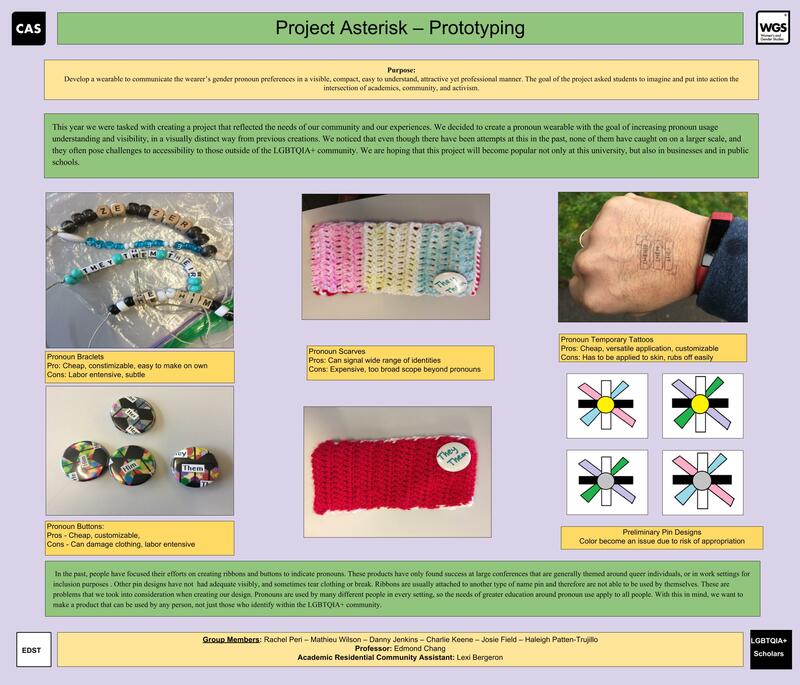 Though all of the prototypes were interesting, colorful, and intriguing (particularly the scarf and tattoos), they did not quite address the project brief. For the most part, the biggest concern across the student groups was the issue of conspicuous visibility, of the perils of marking oneself and outing oneself in regards to gender. 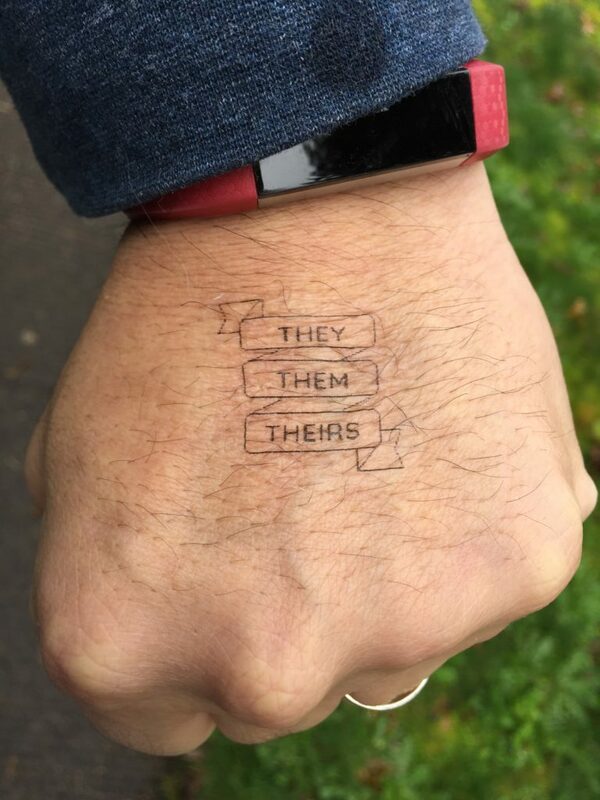 The students were worried that the pronoun wearable would be compulsory and potentially dangerous for students to wear in public in unsafe or untested zones. Given this concern, many of their wearables were removable, easily hidden, or more coded in their meanings. Sympathetic to their worries, I wanted to reassure the group that they could balance design, wearability, visibility, and personal choice. I redirected them back to the project goals and rethink through the target audiences and users. Of all of the designs, the class decided the temporary tattoos and some form of pin would be the best designs to pursue. At the start of spring quarter, the ARC was down to eight students. But the remaining students took what they had done in prior terms and applied them with renewed enthusiasm to the final steps of the Colloquium Project. The first few weeks of class were spent deciding what to do with the prototypes, to further narrow the scope and goals of the project, and to design the final wearable. I reminded them of the start of the whole process and the arc of their progress. 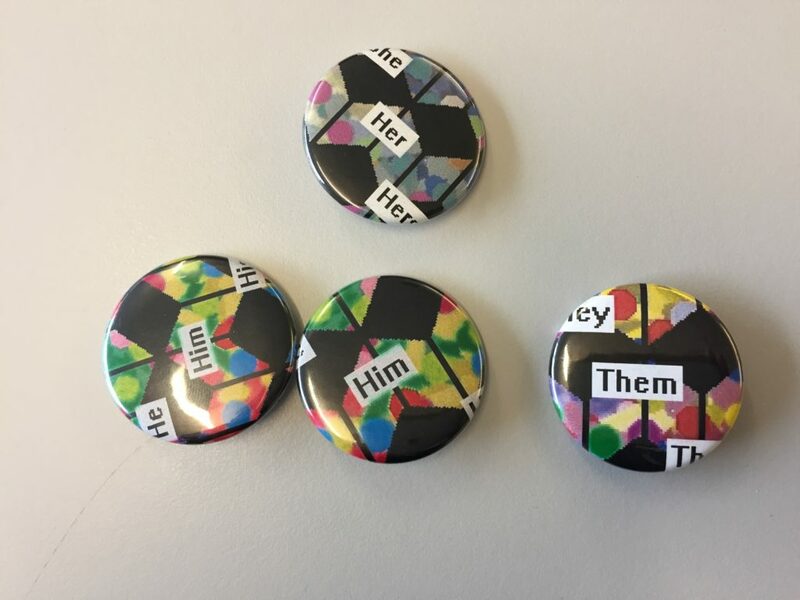 I helped them reimagine the pronoun wearable as a lapel pin, something like they would see worn by a student organization or a public official or on a uniform. I also helped them realize that their solution need to address one specific set of pronouns, knowing that this was a necessary but not exclusionary focus. 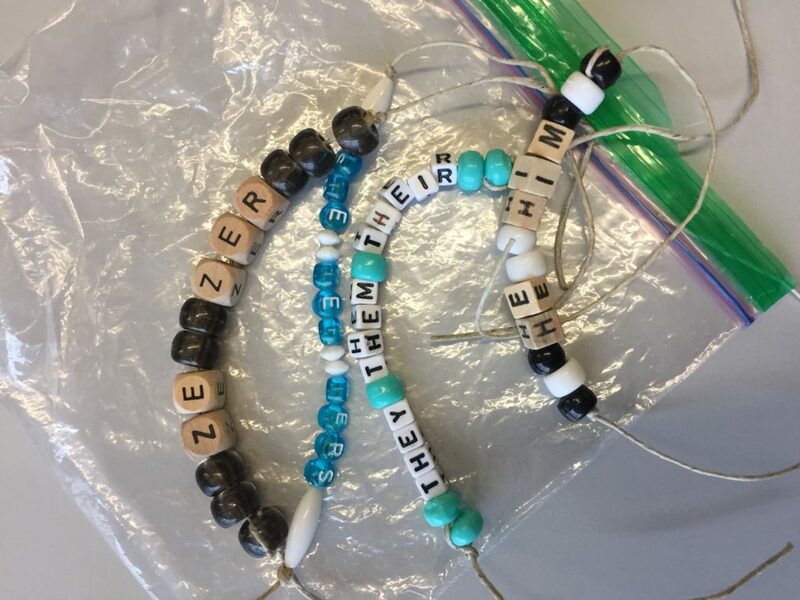 In fact, we talked about just doing a pronoun wearable for they/them. The group discussed text or letters (i.e. 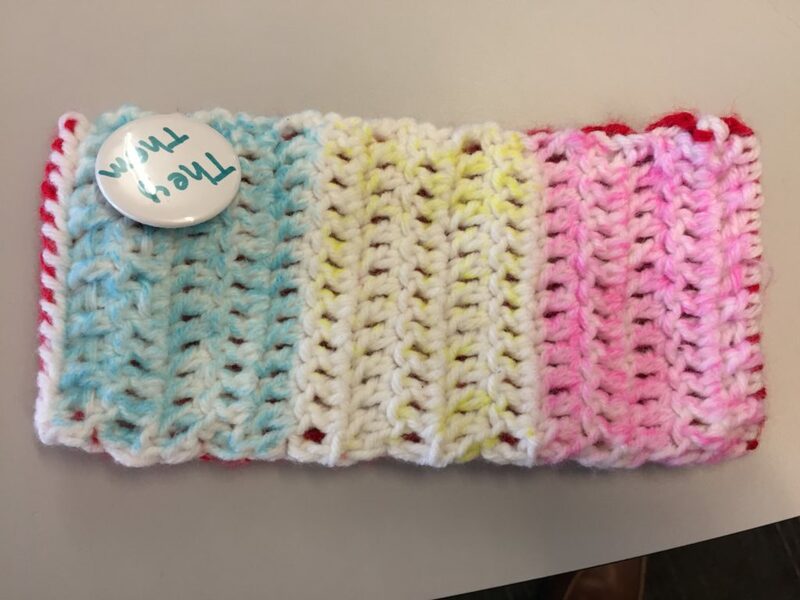 an H for he/him, S for she/her, and T for they/them), colors (i.e. identity flags), and various icons (i.e. punctuation marks). There was an initial push to move away from letters or text (given the normativity of English) and toward something like the asterisk. 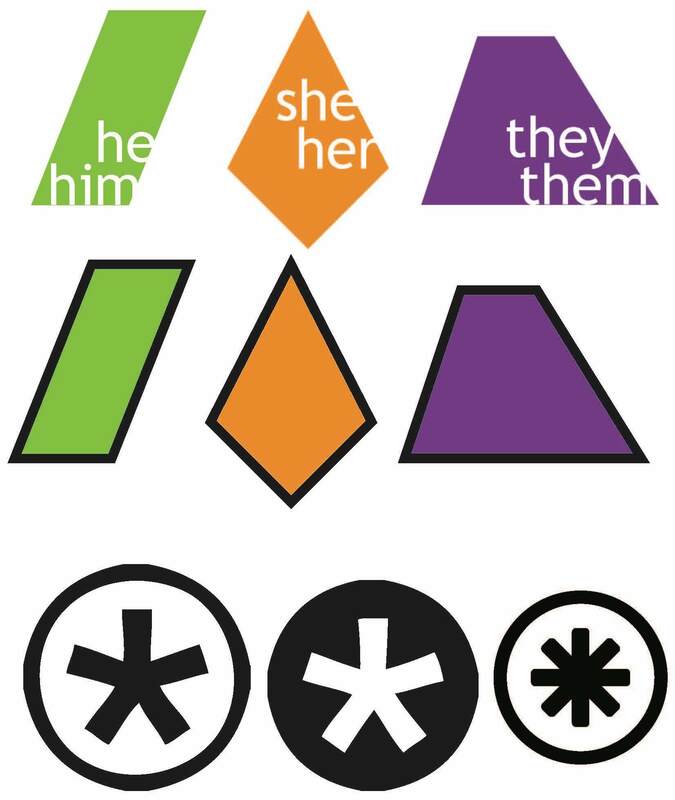 The asterisk (*) symbol has been used by some transgender and gender non-binary communities to signal open possibilities and inclusion. Unfortunately, the asterisk alone did not communicate enough information, specify pronouns, and might be misunderstood as referencing something else (i.e. the FedEx logo is an asterisk). 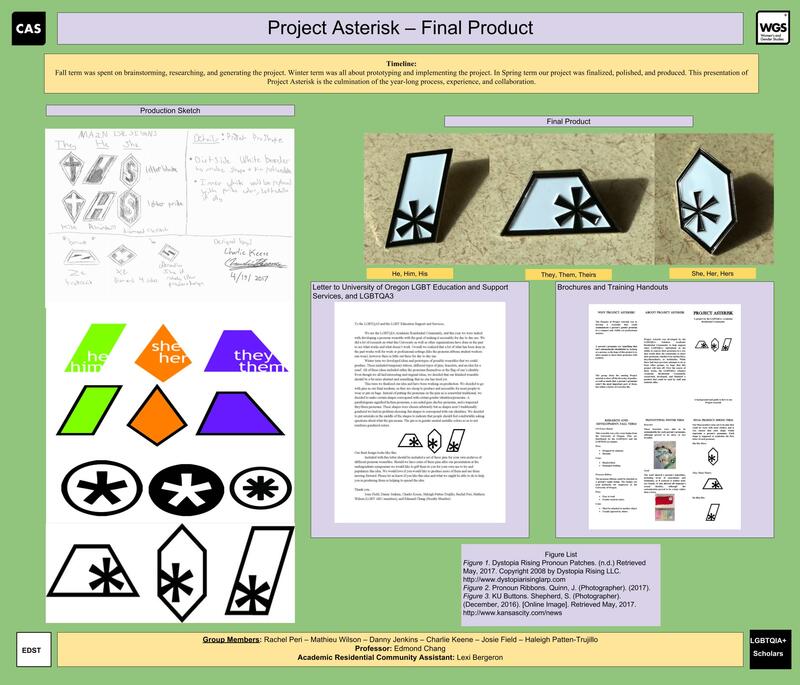 After some conversation, in class and online, the group decided that some sort of shape–iconic and geometric–would make for good pins. The above shapes were possibilities I worked up. We decided to pick shapes that did not have established gendered meanings. We decided to forego colors for the time being, sticking to black outline and white fill mainly because it would limit cost and confusion. And we decided to include the asterisk; though not the focus, the asterisk grounds the pronoun shape and design. The students then set to work to find and get bids from reputable companies to produce the pins, to develop a expository and training brochure, and to prepare posters and props for the OU Undergraduate Research Symposium. The students have also drafted a letter introducing the project to university administrators and LGBTQ+ leadership. 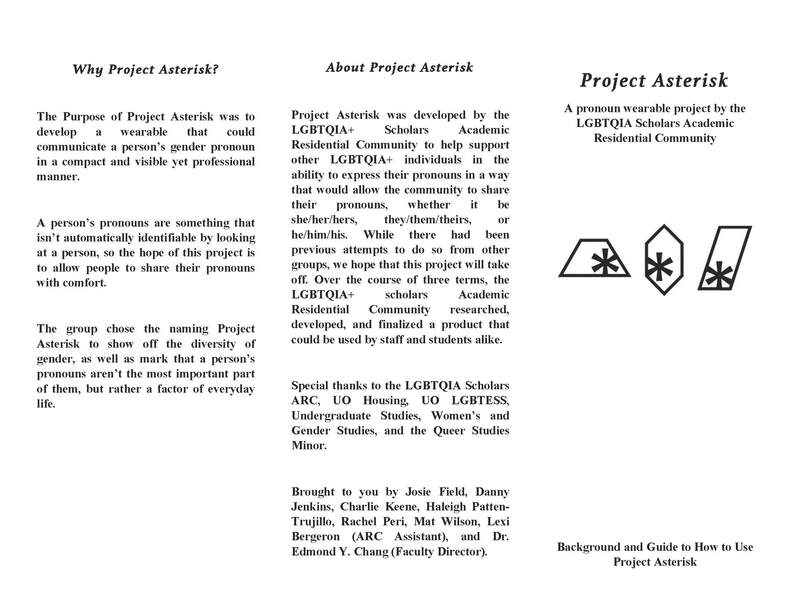 The letter will be sent along with an archival set of the pins in the hopes that the UO might develop “Project Asterisk” as a campus-wide program. Who knows? Perhaps the project will take off and be used at other institutions across the country or across the world. All in all, the project has been decidedly a success. 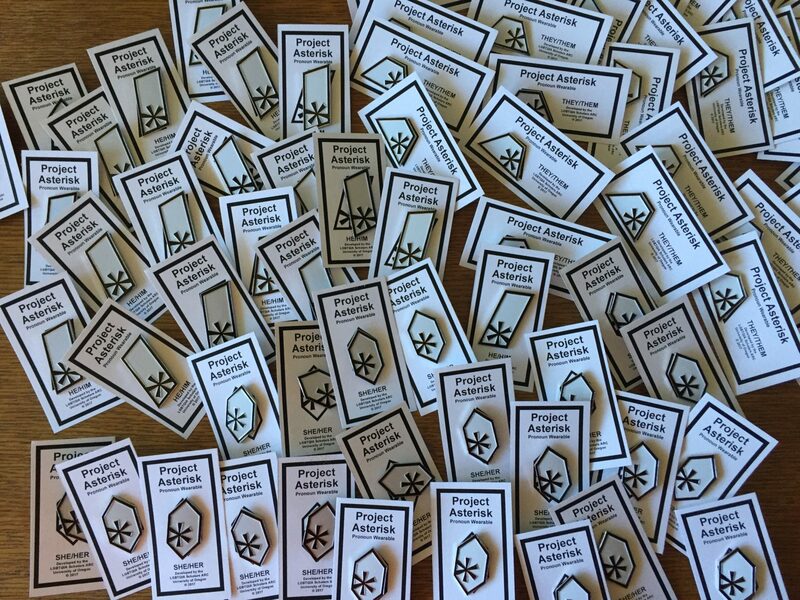 The students have reported that while they are wearing their pins, people have been attracted to their design and have been curious about what they mean and what they are for. Visitors to the poster session have also been duly impressed and suggest continuing the project, refining it, in the next year. I am happy that the colloquium and the assignment worked out and worked its magic. And I am proud of the students for their ideas, labor, and investment. In fact, once they saw the actual pins–made, physical, for real–they knew that they had done something unique, something that they will remember for the rest of their careers and lives. Chang, Edmond Y. “LGBTQIA Scholars Colloquium.” Course Website. Autumn Quarter 2016. http://www.edmondchang.com/courses/lgbtqiascholars16f/. Web. —. “LGBTQIA Scholars Colloquium.” Course Website. Winter Quarter 2017. http://www.edmondchang.com/courses/lgbtqiascholars17w/. Web. —. “LGBTQIA Scholars Colloquium.” Course Website. Spring Quarter 2017. http://www.edmondchang.com/courses/lgbtqiascholars. Web. Part Time Rogue. “Dystopia Rising’s Gender Pronoun Patches Promote Inclusiveness In Our Hobby.” Elsewhere Nightly. 8 Jun. 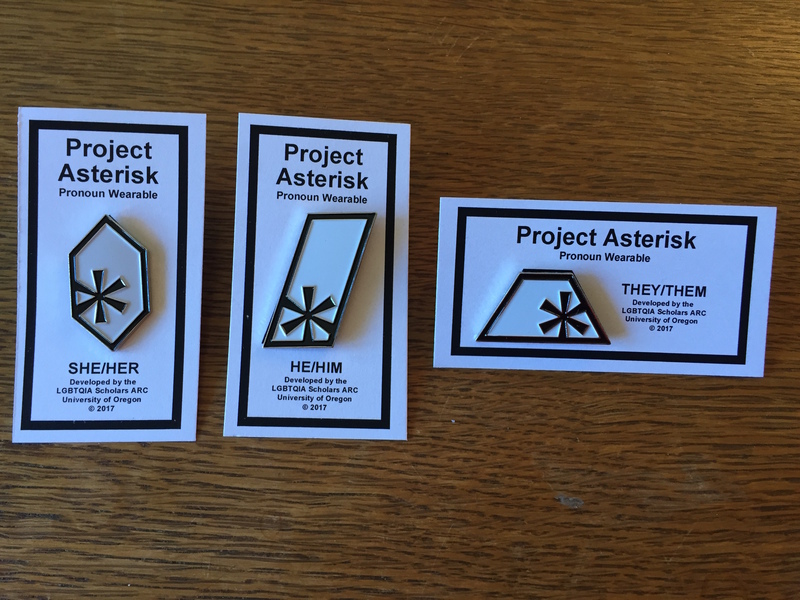 2016. http://elsewherenightly.com/p/dystopia-risings-gender-pronoun-patches-promote-inclusiveness-in-our-hobby/. Web. Sedgwick, Eve Kosofsky. “Queer and Now.” Tendencies. Durham, NC: Duke University Press, 1993. 1-22. Print. 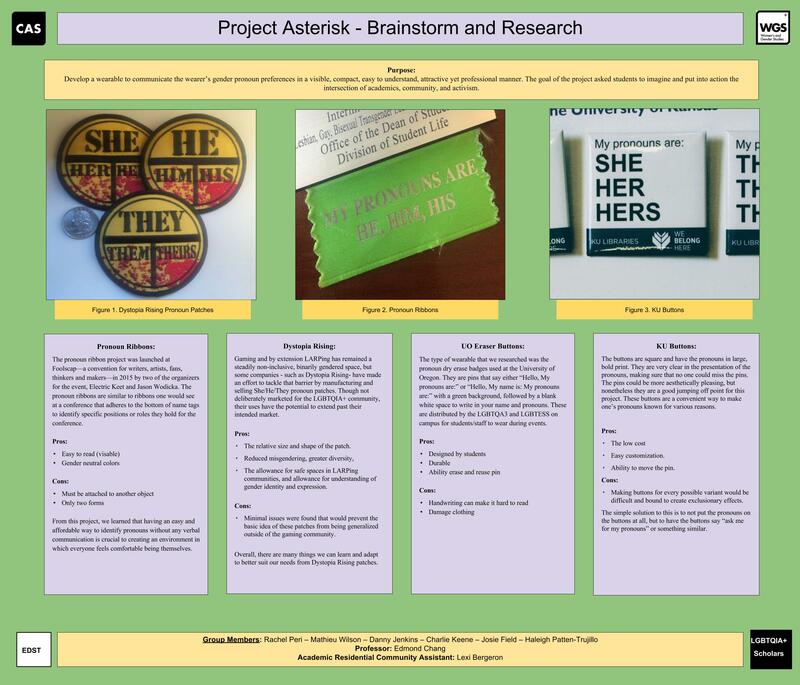 This entry was posted in #fourthyearfaculty, Commentary, Courses, News, Queer, Teaching, Uncategorized and tagged colloquium project, lapel pins, LGBTQIA Scholars ARC, Project Asterisk, Project Pronoun, pronoun wearable, UO Undergraduate Research Symposium. Bookmark the permalink.